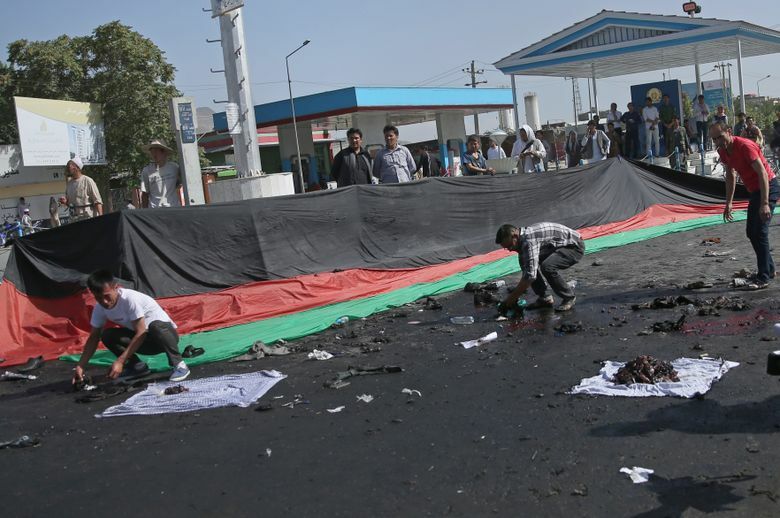 KABUL, Afghanistan (AP) — Afghanistan marked a national day of mourning on Sunday, a day after a suicide bomber killed at least 80 people who were taking part in a peaceful demonstration in Kabul. The attack was claimed by the Islamic State group. 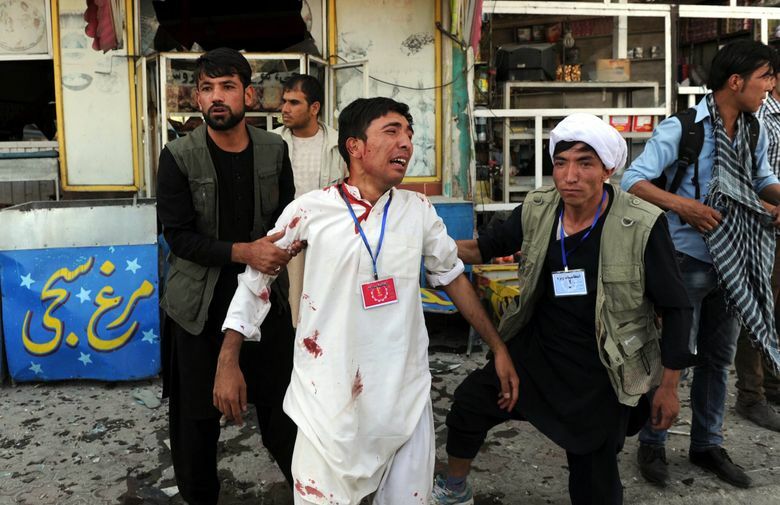 Authorities say another 231 people were wounded, some seriously, in the bombing Saturday afternoon on a march by members of the ethnic Hazara community, who are predominantly Shiite Muslim. Most Afghans are Sunni, and the IS group regards Shiites as apostates. The attack was the first by IS on Kabul — and the capital’s worst since a vicious Taliban insurgency began 15 years ago — raising concerns about the group’s reach and capability in Afghanistan. Bereaved families collected their dead from hospitals and morgues across the capital, and began digging graves as the first funerals went ahead in the west of the capital. Many people chose to bury their dead together with others — rather than in traditional family plots — encouraged by organizers of the Saturday demonstration, who call themselves the Enlighten Movement. In a hilltop graveyard in the Surkh Abad suburb of south-western Kabul, hundreds of people, most of them men, braved high winds and swirling dust to conduct the Shiite funeral rites. Simple wooden coffins covered in the green Shiite flag were carried by men on their shoulders and lowered into graves that relatives had dug themselves with shovels. In the city’s west, in Omaid-a-Sabz, the grieving chose to bury their dead side by side in long rows. Mullah Mohammad Hassan Rasat said the Hazara people felt a deep sense of injustice and anger that the government had not kept its election promise to ensure that development was equal for all Afghan ethnic groups. “Our people only want justice and equal development for all,” he said. Hazaras account for up to 15 percent of Afghanistan’s population, estimated at around 30 million, and say they face discrimination. During the Taliban’s 1996-2001 rule, the Hazaras were often brutally treated. The Taliban were quick to deny culpability for the Saturday attack, however, issuing a statement before IS claimed responsibility. The Saturday attack has raised concerns about sectarianism, and the Interior Ministry announced a ban on public gatherings and demonstrations in an apparent bid to avoid any inter-communal strife. A presidential spokesman pointed out that the ban on public gatherings would not apply to the funerals for Saturday’s victims. IS has had a presence in Afghanistan for the past year, mainly in the eastern province of Nangarhar along the Pakistani border. The Afghan military, backed by U.S. troops, is planning an offensive against IS positions in Nangarhar in coming days. 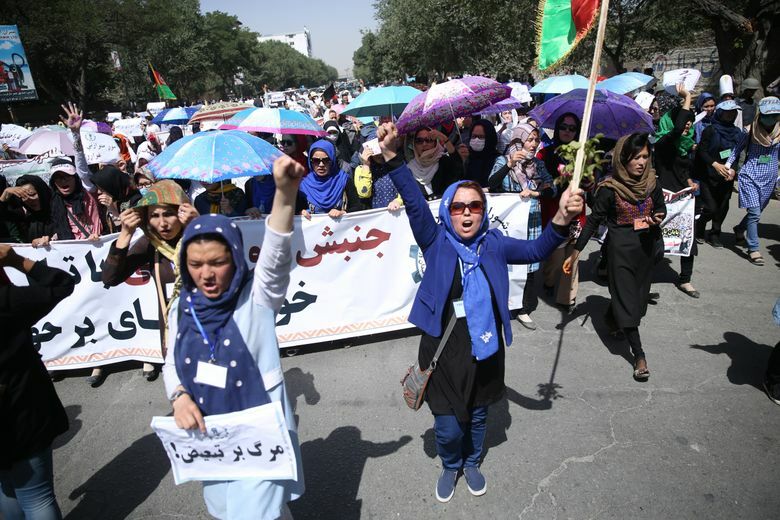 Prior to the Saturday attack, thousands of Hazaras had marched through Kabul to demand the rerouting of a power line through their impoverished province of Bamiyan, in the central highlands. It was their second demonstration; the first was in May with a much better turnout and attended by senior Hazara politicians, who were absent from Saturday’s march. Daud Naji, an Enlighten Movement leader, said on Sunday that they had been told only that there was a “heightened risk” of attack and had subsequently cancelled nine of 10 planned routes. On Sunday, Ghani attended a memorial prayer service in a mosque on the grounds of the presidential palace, his spokesman Haroon Chakhansuri said. The office of the United Nations assistance mission in Afghanistan issued a statement conveying its “deepest condolences and solidarity” and noting that people of all ethnicities across the country were still queueing at hospitals to donate blood for the wounded. 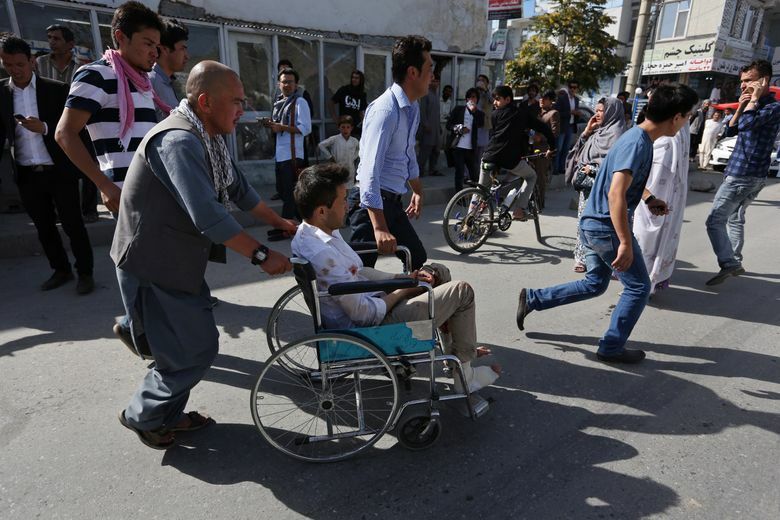 Hazara demonstrators have continued to occupy Demazang Square, where the attack took place as the march was winding down and some prepared to set up a camp, Naji said. They would stay until three conditions were met, he said. The Enlighten Movement wished to have its own representatives, as well as others from international human rights organizations, involved in a commission Ghani has established to investigate the IS attack. The movement also wanted the power line rerouted through Bamiyan, as originally demanded. The multi-million-dollar regional project was routed away from Bamiyan by the previous Afghan government for financial considerations, according to people involved in the planning, who spoke on condition of anonymity as they were not authorized to speak publicly on the issue. Ghani’s spokesman Chakhansuri confirmed that the president has issued a decree to change the name of the square as the Hazaras had asked. He also said that Enlighten Movement members would participate in the investigation commission. In response to the rerouting demand for the so-called TUTAP power project, Chakhansuri referred to a contract signed on June 21 for the transmission of a 300-megawatt power line from the north into Bamiyan. Like the TUTAP line, it is also funded by the Asian Development Bank. The death toll in Saturday’s attack was not yet finalized Sunday, according to the Interior Ministry. The ministry said on Saturday that 80 people were killed; Naji said the Enlighten Movement puts the death toll so far at 84. Associated Press writer Karim Sharifi in Kabul, Afghanistan contributed to this story.